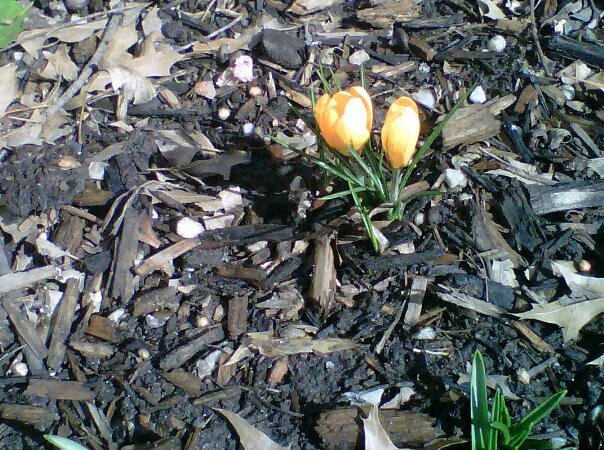 Although it's only March 4, it would appear that spring has arrived in Brooklyn. 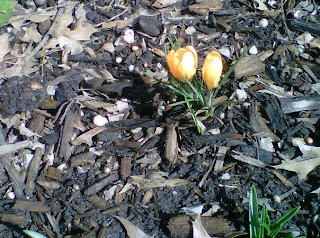 Yesterday's high was nearly 60 degrees, and the crocuses in the back yard are already starting to bloom. A little too early for spring to make an appearance, in my opinion, but there you are. I had plans for progress on several projects for Saturday. Our quilt guild set up a name tag swap and I'm working on one for Jessica. Since I love foundation piecing, I decided to start with a block based on the Pete's Paintbox block (I-8) from the "Dear Jane" quilt. I had to scale it back a little to about three inches, so she won't be stuck wearing a huge name tag. I'm still deciding what to do for the name portion (maybe some embroidery on a cream background? 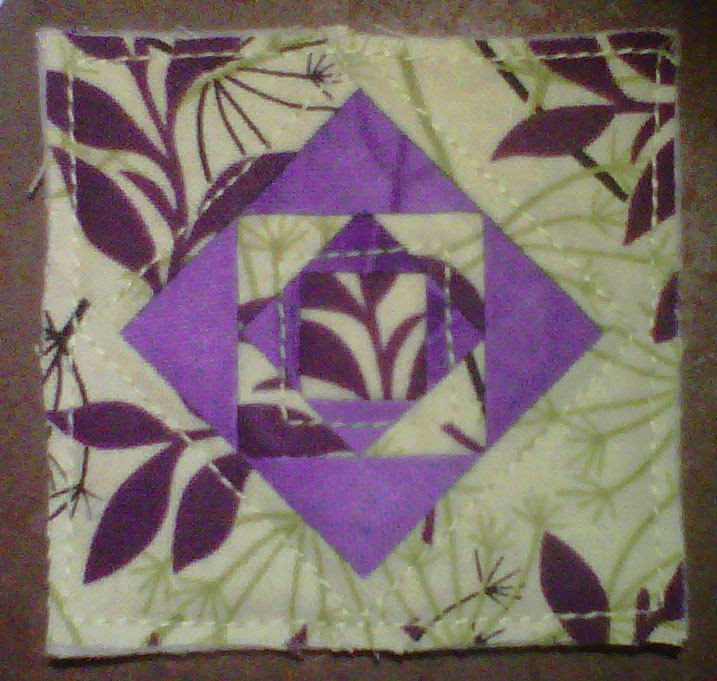 ), but I'm pleased with the mini block. I also put together the blue block for the quilt guild challenge. Since I've only been quilting for a few years, I didn't have masses of scraps for the log cabin (in four colors, no less). Thank goodness, City Quilter (my default quilt store) sells scraps for $6 for all the scraps you can fit in a gallon zip bag. 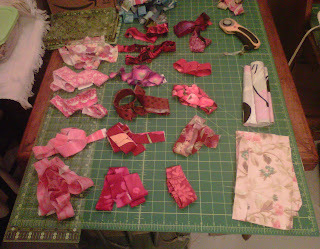 I was able to get almost all the scraps I needed and was able to fill in the blanks with fabric I had on hand. 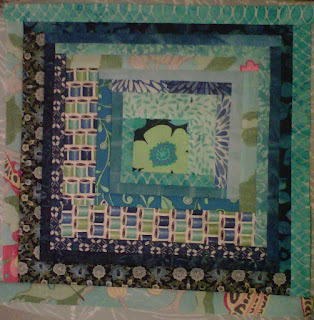 Here's the finished blue block. Now, I just have to finish the pink block and I can (gulp) cut them up and reassemble them. Here are the pink/reds waiting for Sunday. I also made good progress on appliqueing the sashing for my niece's quilt. There's a strip of sashing between the blocks on front and back of each row. 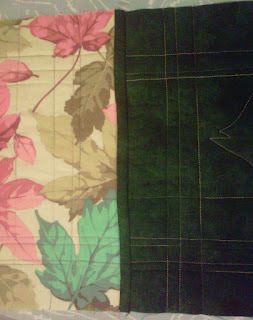 One half is sewn on by machine and the other is hand stitched. The quilt is a surprise (she know she's getting one, but hasn't seen the fabric or pattern), so here's a shot of the sashing between the back of two blocks.